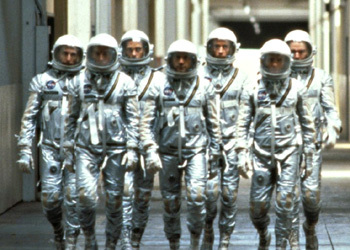 No, that's not a scene from The Right Stuff. It's 14 pilots of the ultra-high-altitude Lockheed U-2 in full pressure suits posing like action heroes in front of their beautiful plane. Eat it, Ed Harris. I wanted to send you a photo you might want to share with your readers. I know you've contacted us about U-2 stories in the past. 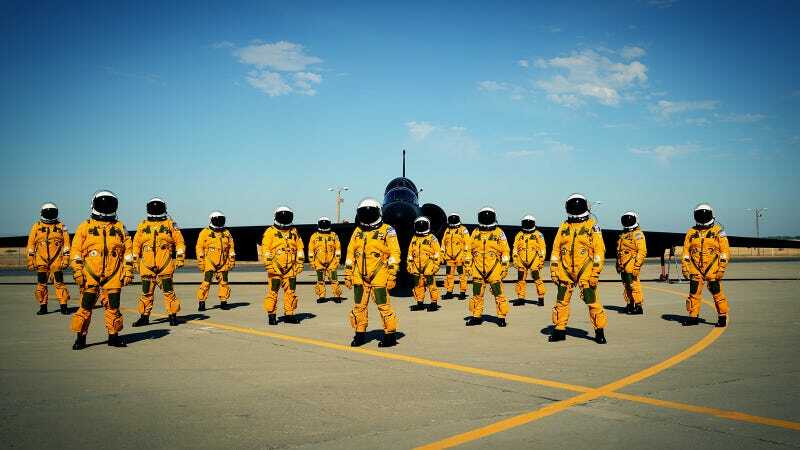 Attached and linked is a photo we just shot of a formation of U-2 pilots in full pressure suits (NASA adopted the U-2 full pressure suits for the shuttle program) in front of a Dragon Lady on the Beale AFB, Calif flightline. As you know, U-2 pilots are now the highest flying humans in the world (70,000+ feet) with the exception of the individuals in the ISS now that the NASA shuttle program has ended. Pictured are 14 of a total of about 80 pilots currently qualified on the U-2. Less people have flown the U-2 than there are people with Super Bowl rings. So yeah, that is pretty thoroughly incredible. Update: Here's a link to download the full 19MB original file.